BMW, the German car manufacturing giant, has turned to 3D printing to augment its workers and help them battle joint strain. 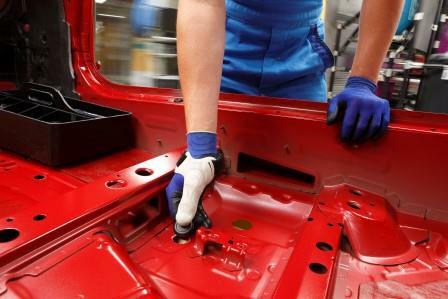 According to the press release, the company has put new technology in place to reduce strain on manufacturing-line workers’ hands with the 3D printed thumbs that act as support and help workers fit certain parts into the cars more efficiently and more easily. The orthotic devices are being produced in-house by BMW in partnership with the Department of Ergonomics at the Technical University of Munich. BMW said the use of the technology was part of its efforts to offer the “best possible support” to workers, reports the BBC. “We would welcome anything that is worker-focused, but I would say that this is probably only addressing one part of a complex problem. There are many things that can cause stress like this, including posture and the number of times they do a task,” Professor Peter Buckle, Head of the Ergonomic Research Centre the Robens Institute said. Each of the 3D-printed thumbs is created as a custom orthotic device using a portable 3D camera which captures the unique size and shape of each line-worker’s thumb. The scan of the thumb is then used to build up a thumb guard made of a semi-flexible thermoplastic polyurethane plastic. The polyurethane plastic is a hybrid material mixture of hard plastic and soft silicone which is created by a 3D-printing technique called selective laser sintering. Using a laser, the plastic powder is then fused into layers, building up the structure one thin slice at a time until the full 3D structure is created. “The innovative orthotic devices are applied as part of a pilot project in an assembly area where rubber plugs are fitted. These have to be pressed in with the thumb and close, among other things, the drain holes for the paint coat. Even for people with strong hand muscles, this movement requires a certain effort. In order to prevent the unnecessary overstretching of the thumb joint, the finger cots made of thermoplastic polyurethane are put over the thumb like a second skin,” it says in the press release. The company revealed that initial feedback on the thumb supports has been good and that it’s evaluating how such aids could be used in other areas.